Rye Rye (AKA Ryeisha Berrain) is a talented American rapper and dancer hailing from Baltimore, MD and signed to N.E.E.T. Recordings/Interscope Records. her debut album, Go! Pop! Bang! is due for release sometime this summer. Her new single, "Never Will Be Mine" features a lovely sample of Robyn's hit 2005 single "Be Mine!" and is actually the third single off the forthcoming album. Previous singles, "Bang" and "Sunshine" both feature English singer/songwriter and rapper M.I.A. 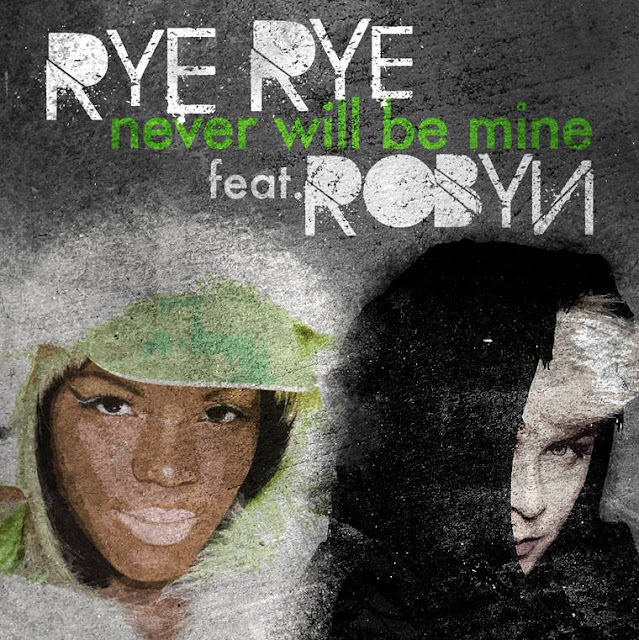 In the colorful video for "Never Will Be Mine," Rye Rye laments about a lost love, while Swedish singer/songwriter Robyn passionately sings her hook. The Tim Nackashi (OK Go, TV on the Radio, Maroon 5)-directed video was shot in Los Angeles and features both women, rockin' out in stylish hipster fashion. The video for "Never Will Be Mine" premiered on VEVO June 15th and is now available to download on U.S. iTunes HERE. You can also pick up the single on iTunes HERE. Make sure you watch the video AND the special behind the scenes clip, featuring both Rye Rye and Robyn as well as director Tim Nackashi. Catch Robyn on tour with Katy Perry now, tour dates below. When I first heard Skylar Grey featured on Diddy-Dirty Money's "Coming Home" I thought to myself, "I wonder what ever happened to Holly Brook?" You remember Holly Brook, don't you? The female vocalist on Fort Minor's one and only hit song, "Where'd You Go." Well, turns out that Holly Brook and Skylar Grey are one in the same. I guess that answers my question! After re-entering the spotlight as a songwriter and featured vocalist on tracks like "Coming Home," "Love The Way You Lie" (Eminem & Rihanna), "I Need A Doctor" (Dr. Dre) and "Words I Never Said," (Lupe Fiasco) Grey is ready for her own spotlight. Invisible is Grey's highly anticipated debut solo album, and is due for release sometime this Fall on producer Alex da Kid's KIDinaKORNER/Interscope Records. The album was produced by 27-year old English (mostly hip-hop) producer Alex da Kid, an up and coming talent himself, who's worked with Nicki Minaj, T.I., Hayley Williams, Eminem, Rihanna, Diddy-Dirty Money, B.o.B., Lupe Fiasco, Dr. Dre and more. Earlier this month, Grey released a promotional single from the album, the trippy "Dance Without You," which was made available as a free download for 48 hours through her website. The album's first official single and title track, "Invisible" is due out later this month, but you can listen to it below. The song is pretty enough, but I'm beginning to wonder if Grey can hold her own as a solo artist. The song just feels like it's lacking something...that something being a guest rapper. Grey's voice is pretty enough, but it doesn't really carry the song anywhere. It's just another pretty song, which unfortunately, isn't enough to make someone into a solo star. "I have been working so hard with Alex on this music; I'm excited it's finally going to be out there for everyone to hear. I won't have to describe it anymore, because the music can finally speak for itself," says Grey. "Also, I'm very influenced by film and it is my hope that when people listen to my music, they are consumed with vast, cinematic imagery." The funny thing is, I can very clearly see the cinematic influences she's referencing here. I can totally hear this song playing as the main song in a movie trailer, but when stripped away of any sort of imagery, the song just doesn't hold up by itself. The pacing of the album's two songs is also a bit slow and steady for my liking. I hope Grey includes a couple of more up-tempo tracks or else I'll fall asleep. According to the PR, the album chronicles "the transformation Grey has made over the past few years as she has struggled to find her place within the music industry." Reading stuff like this REALLY REALLY makes me want to like her, but based on the two songs I've heard, I just can't get on board yet. I'm still waiting to be impressed Ms. Grey. The album will reportedly contain one feature collaboration (yet to be announced) and a full tracklisting is forthcoming. Skylar Grey will make her live solo debut at this year's Lollapalooza festival in August, so stay tuned for that. Download "Dance Without You" on U.S. iTunes HERE. Skylar Grey is a singer, songwriter, and multi-instrumentalist who is responsible for co-writing some of the most memorable songs to light up the Billboard Hot 100 and iTunes sales charts over the past year. Among her most recent credits are Eminem's "Love The Way You Lie," which earned Grey two GRAMMY Award nominations for Song and Record of the Year; Dr. Dre's "I Need A Doctor," which she performed alongside Dre and Eminem on the 2011 GRAMMY Awards telecast; Diddy Dirty Money's "Coming Home," which she performed with the group on American Idol this season; Lupe Fiasco's "Words I Never Said," and T.I. 's "Castle Walls." Now splitting her time between the southern coast of Oregon and Los Angeles, Grey is originally from Mazomanie, WI.